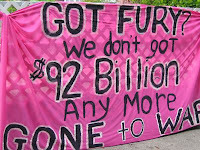 For the people who, sighting hot pink, begin honking before we even get our banners unfurled. For the hundreds and more of cars who slow down, honking, smiling, waving, throwing their fists in the air, yelling “RIGHT ON”, giving the peace symbol. For the thin white man who lays down his bike and picks up a side of the banner to hold while flashing the peace symbol with his other hand. For I think if just one of these people call their senator, Boxer, Feinstein or Pelosi, it’ll be one more call made that we didn’t have before I banner!